This is an alternate way to paint space hulk metal decking to give it a bit of color without adding a tremendous amount of work to the process. Most of the time, we base our "decking" bases with GW Boltgun Metal and then give them a quick wash with GW Badab Black to pull out some surface detail. There's nothing wrong with this at all. I've done it with great success myself. 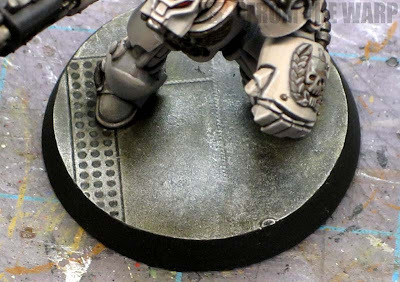 This technique is just as easy and gives your metal decking a bit more of a military feel since it adds a touch of muted green to them. It's not much, but it's worth mentioning that I used specific washes to do this. Mainly for their properties. I'm sure it would work using other materials, but the effect might be slightly different in the end. 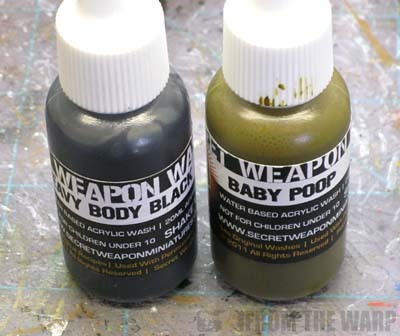 The key part to this whole thing are two washes from Secret Weapon Miniatures. You're going to need Heavy Body Black and Baby Poop. Aside from them, it's GW Boltgun Metal and Silver. That's it. With these two washes, you're going to mix them at a ratio of 1:1. For those not sure of ratios, that means for each drop (they come in dropper bottles) of one color, you add a drop of the other color. So if you add 5 drops of the black, you'll need 5 drops of the other color. The black is used to darken the Baby Poop color down. On it's own, it's a bit too bright for what we want to do. The base in the picture up top also comes from Secret Weapon. I first picked it up because I loved how clean they were. They aren't cluttered up with lots of little bits of junk. But... the detail on them is very fine. So fine that one kinda heavy layer of paint and you'll lose the majority if not all the detail on them. That made me worry to no end. You can't just go slopping the paint on these guys or you'll destroy them. That's part of the reason I came up with this approach, I was afraid my regular methods would destroy the detail on them. So what did I do and how do you do the same thing? Easy, the first thing you do is get a good, smooth layer of GW Boltgun Metal down. I did two fairly thin coats (I thinned it with a bit of water). After that, it's 3 passes with the wash mixture. You can do more or less depending on the darkness you want. I found three to get me close enough to what I imagined in my head. Make sure you let each one dry completely before adding the next! After you have your washes down and completely dry, it's time to do a little drybrushing. The first pass is with GW Boltgun Metal and the second pass is with a silver color to pick out some key edges and spots worn back down to the bare metal. Since there is not much raised surface texture on these bases in particular (actually none at all), the drybrushing is done in a tiny circular pattern across the surface. This will create some areas that are "worn down" more than others. The ultimate goal is to make the decking look as though it is traveled regularly in some places while other areas are a combination of paint and grime that has accumulated on the surface over time. When you do drybrush like this, you really want to get as much paint off your brush as possible. It might take a couple repeated passes to build the metal back up, but it's worth it in the end. You don't want to try and get the effect in one pass, you'll end up ruining your base. And like always, it doesn't stop here, you can add other things to your base or add additional washes of different colors to simulate spills and such. I opted not to add any rust or other fancy effects to these bases since I wanted them to fall into the background and not draw attention away from the models. I really did keep them simple, but it shows you that you don't have to go to the ends of the earth to get a decent looking base. Have you ever tried to use a fine-grained foam sponge for drybrushing flat surfaces? I sometimes have trouble using brushes for drybrushing at might leave traces of brush hair strokes (ie. a paint trace from a single hair of brush). This is usually fine as it simulates a scratch or somesuch, but with a foam sponge the effect might be smoother. Icchan: No, I haven't although I really like the idea now that you mention it. That might be worth trying since I do run into the brush stroke problem if I have too much paint on the brush when I go to drybrush.